“Inspirare” by M.F.A. student Joan Farrenkopf is currently gracing the front of Hendricks Chapel. When it comes to her latest creation, artist Joan Farrenkopf is as interested in what you feel as well as think. In fact, thinking is secondary. Farrenkopf, a student in the M.F.A. program in the College of Visual and Performing Arts, designed and installed her creation, which she calls “Inspirare.” In Italian, inspirare means to inspire, to breath in, which is exactly the end result of Farrenkopf’s work. 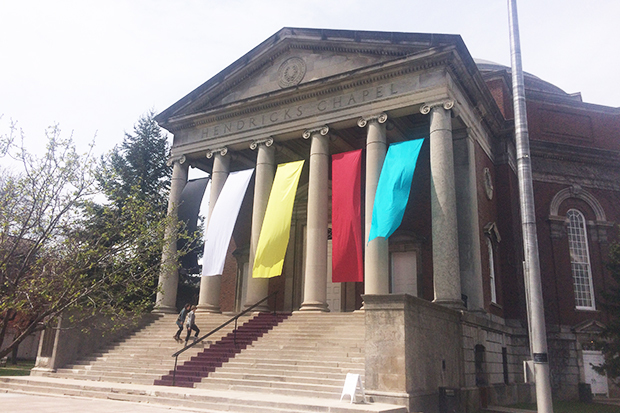 “Inspirare” is a series of long, flowing swaths of colorful fabric draped between the front pillars at Hendricks Chapel. A slight breeze makes it appear as if the artwork has a life of its own. As for the colors, Farrenkopf has her own mythology for the selection. But she’s much more interested in yours. “Inspirare” will be on display until Wednesday, May 11.